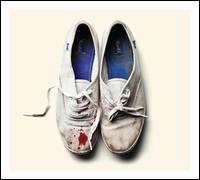 Sleigh Bells’ Treats is an album that got played over and over again at my last apartment. The first time that I heard the record, I couldn’t tell whether or not I liked it. A mixture of hip hop, lo-fi, drumline and stadium rock seemed a bit too kitschy…plus, I was too busy focusing on losing at pool which Sleigh Bells unfortunately became a soundtrack for. Then I heard the sample of Funkadelic’s “Can You Get to That?” on “Rill Rill.” I became just as hooked as all of my shilling friends (I listened to a lot of Maggot Brain in college). Sleigh Bells has a sound that is all their own on Treats. Aside: I actually missed seeing them live in Albany on a weekend in 2010 that some friends and I went to see Belle & Sebastian and Teenage Fanclub at the Brooklyn Waterfront. I wasn’t sure what to expect for a follow up from vocalist Alexis Krauss and guitarist/producer Derek Miller. The opener, “True Shred Guitar,” shows Sleigh Bells straying from the hip hop production aesthetic on Treats (perhaps owed in part to being signed to M.I.A.’s label) to an 80’s metal feel. The Mötley Crüe-d riffing and loud, ‘live’ production on “True Shred Guitar” are enough to fill a stadium let alone a bedroom, but I’m not so sure that it’s the right direction for the band. It’s as if the Treats cheerleaders were stuck in the gym for the winter with a bunch of off-season, metal-crazed meatheads. Now that I think about it, Sleigh Bells would be great workout music with its energy and focus on competition… I’ve made a mental note in the event that I ever excercise again. Reign of Terror still employs Sleigh Bells’ uniqueness of sound, but individual tracks don’t stand out like they did on Treats. It’s a collection of near misses. “Crush” played on repeat more than a few times this week, but the heart of the album in “Leader Of the Pack,” “Comeback Kid” and “Demons” does not equate to the strength of “Infinity Guitars” through “Crown on the Ground” on Treats. I’m hoping that the whole metal fixation on Reign of Terror is a “Hit It and Quit It” situation. Knowing Miller’s history as the guitarist for Poison the Well, Sleigh Bells could easily slip into pop metalcore with an emphasis on Alexis’ screams (harsher than “Straight A’s”) and the rapid, double-peddling toms on “Born to Lose” and “Never Say Die.” Personally, I’d like to see a lo-fi OST for the next iteration of the Bring it On franchise for Sleigh Bells’ third release. I’m kidding. Sort of.